Red and Blue for Election Day 2016. So, did you all go vote today? I hope so. =) I went to vote around 5.00 PM and I was there a total of about 20 minutes (including parking, walking in and back to my car). Easy peasy. Of course I posted a selfie with my "I Voted" sticker on Instagram. As I am typing this post, I am listening/watching CNN and finding out part of the results. This is exciting, overwhelming, scary and nail-biting, isn't it? Interestingly enough, Michigan (my state) is one of the wild cards this year and one of the states they don't know the results of, yet. They are talking a lot about Michigan, in particularly Wayne County as being crucial to the main results, on this particular election - hmmm how interesting! Anyhow, this outfit today is actually what I wore to go vote. I honored both parties and America with my Red and Blue. But of course I added just a tiny pop of white with my little flower pearl and crystal ball pave hair barrette. I actually wore this outfit to work, too. We were allowed to wear jeans today and mine were even slightly distressed (shhhh, no one noticed or said anything). I was at work only for a few hours. I snapped these photos right after. But when I went to vote, I did add a little suede jacket to this ensemble (not pictured) because it was chilly and quite windy out. 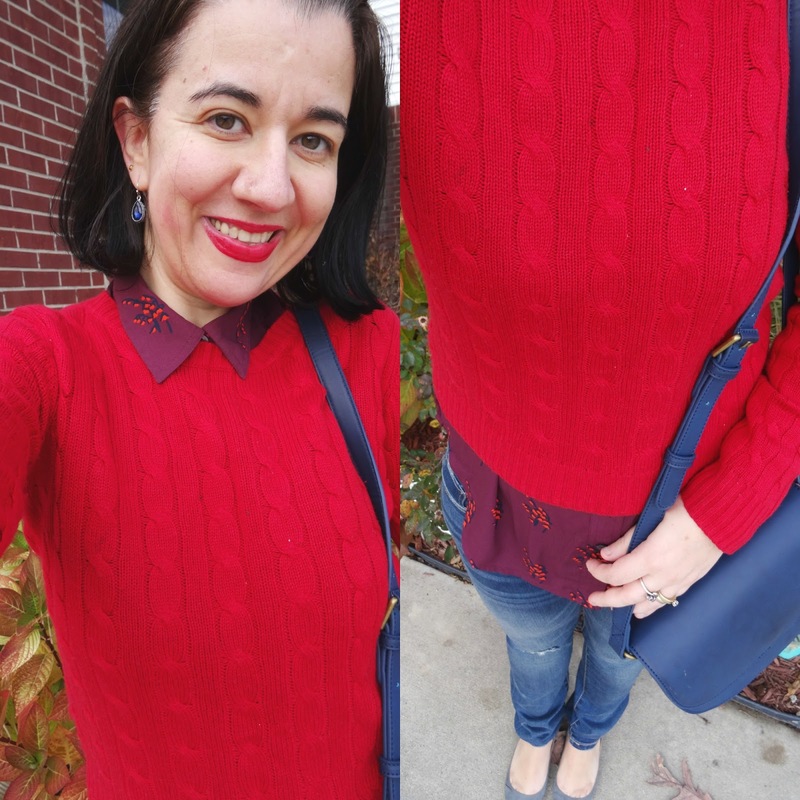 I love how this outfit is a red+blue colorblocked look, but it is also monochromatic with the three shades of red (sweater, shirt and lips - of course I had to accessorize with red lipstick) and the three shades of blue (jeans, bag and earrings). The pointy mini wedges are gray but it is a dark shade of gray which even looks blue-ish. My new Dark Red/Wine Button-Down Utility Shirt from Loft has a small Fall Pattern in it. It is described as 'vines' by Loft and they look looks flickers in bright red and blue. Did you cast your vote today? What did you wear? Did you put together a patriotic outfit? For more on voting and how I felt about this year's election, read yesterday's post. 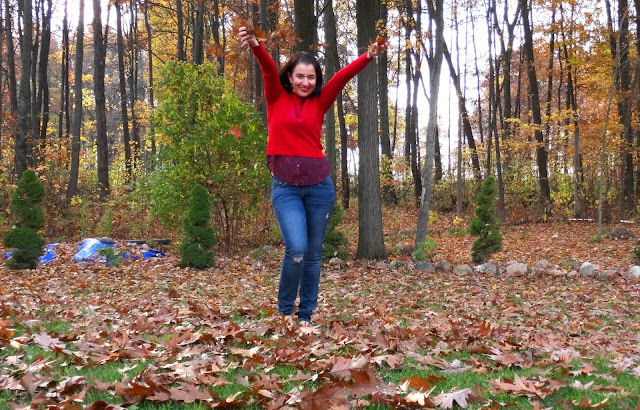 Look at the color and pattern of my shirt, it matches the red-ish tree behind me, perfectly! Red Silk+Cashmere blend Cable-Knit, Crew-Neck, Cropped Sweater: The Limited (Old) (very similar, Huge Steal), (similar, regular length, Great Deal, love this), (similar, on Huge Sale), (similar, my Favorite). 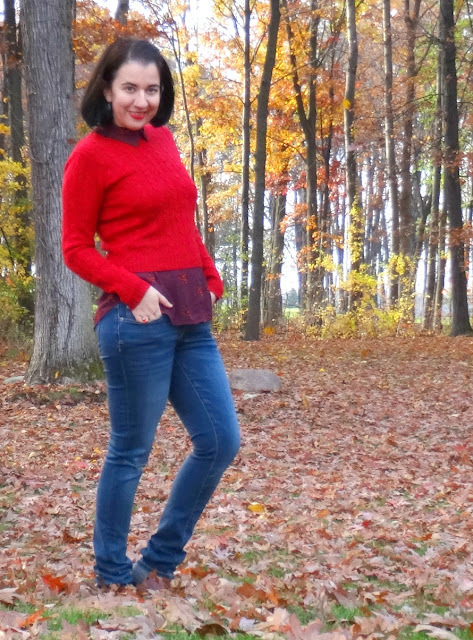 Dark Wash, Lightly Distressed Blue Skinny Jeans: Aeropostale (New) (very similar current option by Aeropostale, Steal), (similar, Great Deal), (similar, small Splurge, my Favorite). Silver-tone, Dark Blue Crystal Teardrop Earrings: Meijer's (New) (similar, Steal), (similar, vintage-looking, Fantastic Deal), (similar in navy, Great Deal, love these), (similar, fancy option, my Favorite). 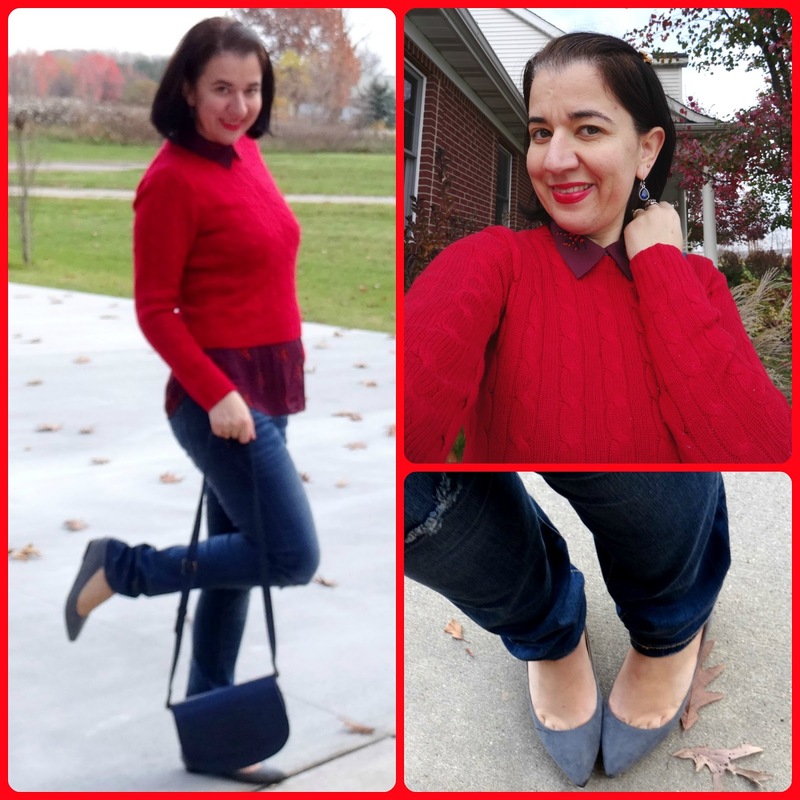 Medium to Dark Gray Real Suede, Pointy Shoes w/ Small Wedges: Massini via Meijer's (New) (very similar, Splurge, love these), (very similar), (similar, Mary Jane style, Huge Sale, my Favorite), (similar, on Sale), (similar, Great Deal). A brand-new Thursday Moda linkup will be Live at 6.00 PM Eastern time tonight on Wednesday, November 9th 2016.